This morning I served Puli Sevai, a quick breakfast prepared using left over Idiyappam aka steamed rice noodles. In our home, we enjoy a variety of quick to make tiffins, the South Indian fare, usually served for breakfast or an early dinner. Some of the favorites include a variety of flavored rice sevai (home made idiyappam). Idiyappam or rice string hoppers, forms the main base that is tossed in a tempering of spices and flavored with either lemon or tamarind, tomato, coconut, black pepper, yogurt and the likes. The savory sevai variations make great tiffin recipes, South Indian style, that are not only quick to make but also filling and full of flavor. You can check out the Vegetable Sevai recipe that I have blogged earlier. 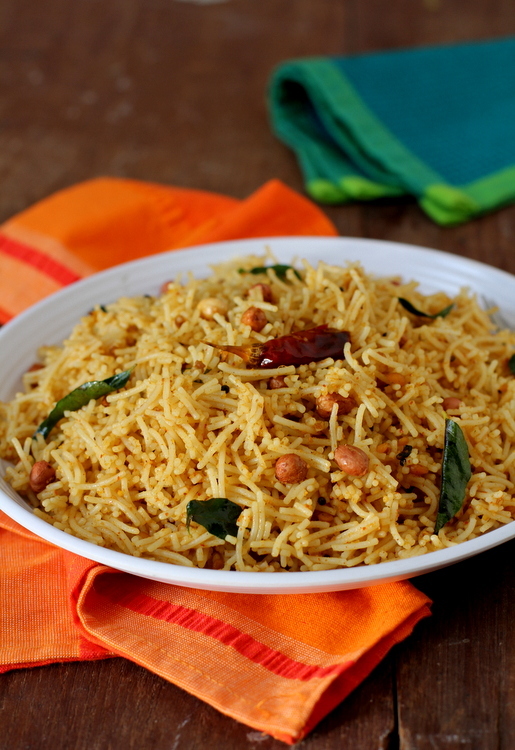 Idiyappam or rice sevai is not to be confused with Vermicelli aka semiya. To learn how to make rice sevai at home, do check out Idiyappam recipe. If you are short on time and cannot make Idiyappam from scratch, use store bought instant rice sevai to prepare tamarind sevai. If using home made idiyappam, light loosen the rice noodles without crushing them. Set aside. Heat oil in a heavy bottomed vessel, add mustard seeds and allow to splutter. Add spilt gram dal, chana dal and asafoetida and allow the dals to turn red. Add curry leaves and dry red chilies and immediately add the tamarind paste and turmeric powder. Allow the paste to cook on low flametill rawness disappears. Add salt, roasted peanuts and jaggery and mix well. Add the rice noodles and toss to coat. Mix well but do not over mix. Cook for a minute, turn off flame and remove to a serving bowl. Serve warm. If using store bought rice sevai, cook them in lots of hot salted water till they turn soft but not mushy. Strain and allow the water to drain. Use the cooked rice sevai as required. 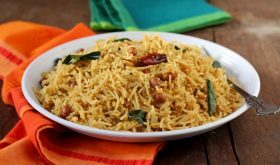 Another variation is to garnish the puli sevai with fresh grated coconut. Another variation is to add a tbsp of sambar powder to the tamarind base and mix well. Superb Madam. I have noted down the contents of this recipe & will prepare immediately for my next Breakfast. Thanks. Super dish. Mom often makes it. Thanks for sharing. You have such unique recipes. Never have thought of this. I make puliodere so many times and always with rice. Will try this one. Thanks.